(A) Consensus immunome clusters (CICs) in the LMC training (n = 465) and test (n = 238) data sets ordered according to the dendrogram output from ConsensusClusterPlus (see Supplemental Figure 3). The details of gene clusters G1–G4 are given in Supplemental Figure 4. 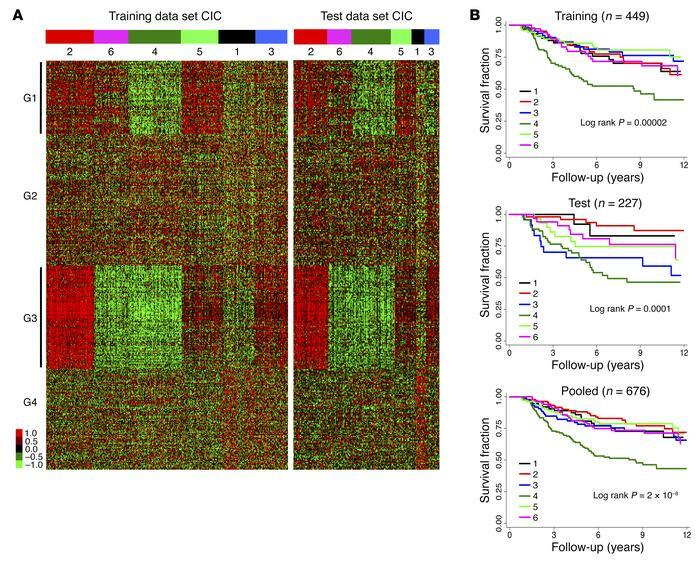 (B) Differential melanoma-specific survival for patients with tumors in the 6 CICs in the training, test, and pooled data sets unadjusted for histological factors. Cluster size: 11%, 21%, 13%, 25%, 15%, and 15% for CICs 1–6, respectively. Cause of death was unknown or was not melanoma for 27 patients, and they were excluded from survival analysis.